I’m a college student who doesn’t have a lot of money, I’ve to be careful in what to spend my money on. That includes food. When I’m buying ingredients I try to think about the number of times I can use them in different recipes. I like to eat but I’m not a huge fan of only eating processed stuff so most of my recipes are simple yet healthy (with the occasional splurge). I really like this recipe, you can make a few variations like adding coconut milk which is amazing but also very high-caloric. This recipe is great without it so I’ll leave the choice to you! – Add the chicken thighs. Let them gain color, it’ll take about 3/4 minutes in each side. It can take longer so just see how it looks. – Add the curry, mix it with the chicken. – Add water and salt and let the chicken cook. I’m not going to give any measurements but for the first time let the water cover the chicken. After that when it’s almost without water, check if it’s cooked, if not put only one cup of water at a time. 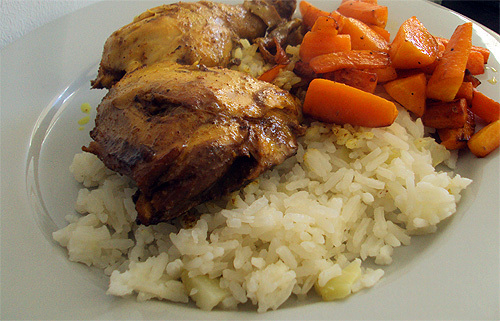 When it’s done serve it with your favorite vegetables and rice!